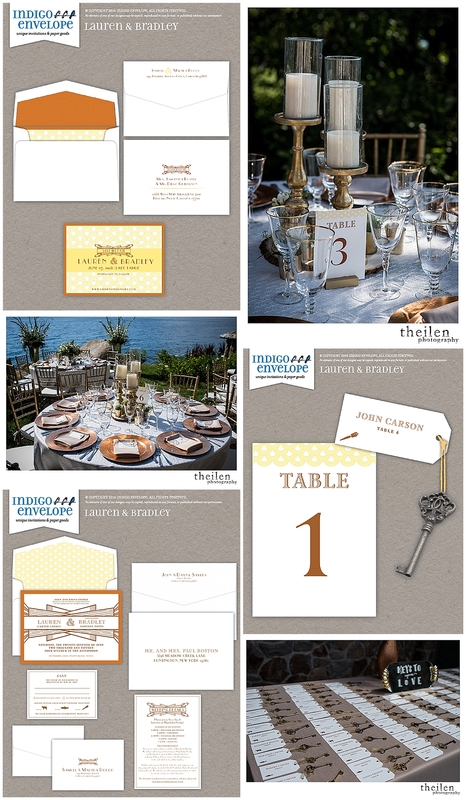 We love Art Deco-inspired events like this wedding in Lake Tahoe, which was a scene fit for the Great Gatsby himself. For Art Deco events, we create invitations and other details using our collection of several thousand graphics and images from this memorable era in art and design. Lauren and Bradley’s design used two bold features. The “wow” factor came from metallic, foil-stamped, copper accents. A yellow Art Deco pattern added color and style. Repeating that pattern on the other items in the wedding suite tied everything together visually. A letterpress invitation panel added the over-the-top feeling of Art Deco style. Name tags tied to antique keys took the place of typical place cards for an extra special, romantic touch.